First we will add two actions, up and down, so that the user can control the order for each item by clicking one of the two actions above. 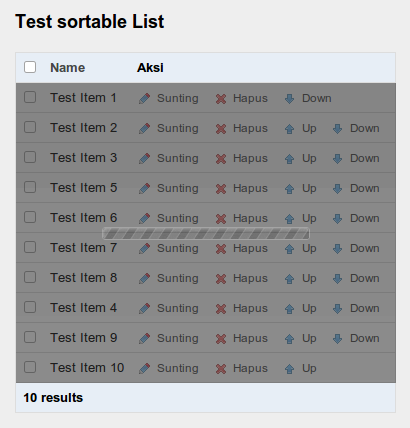 Initialize the cache directory by visiting the test_sortable module from your browser. Copy _list_td_actions.php file from generated cache directory into test_sortable templates module. Disable the up action for the first item and down action for the last one. Below is the final code. The moveUp() and moveDown() functions are built in functions generated by sortable behavior. The sortable table is now fully functional. Try it by moving items up and down. jQuery TableDnD plugin (put into web/js directory). css style for confirmation message (taken from here). You can place this css style in the main.css file. Now that everything is ready, let’s get started. Copy _list.php file from generated cache directory into test_sortable templates module, add the code below. If you’ve already loaded jQuery library, remove the first line. Define an id for tbody and tr tags, which will be used as parameters for the AJAX request. Once the user drags an item and releases it to reorder the table, an AJAX request is made with the following parameters: tableId=rowId1&tableId=rowId2&tableId=rowId3…. Let us add executeAjaxSortable() function to our actions.class.php to serve the AJAX request. That’s it!. Refresh your browser, and try to drag and drop a row..